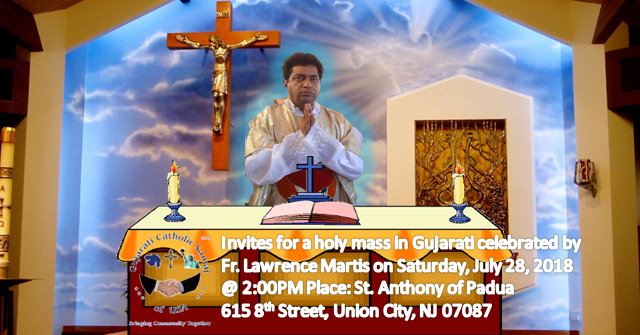 GCSofUSA invite all member and faithful for a holy mass in Gujarati celebrated by Fr. Lawrence Martis. Gujarati Catholic Samaj of USA invite all members an faithful for a holy mass in Gujarati celebrated by Fr. Lawrence Martis. He was here last year around the same time and he participated in our annual picnic of last year and we were fortunate to have his company again this year for the 4th of July annual picnic. We were not able to arrange a Gujarati mass last year but this year it all worked out well. Fr. Alex is also in town and he will be joining us for the mass and get together. Time: 2:00PM mass followed by get together with light refreshment. We are thankful of Fr. Aro Nathan for his unconditional support as always.